Conakry, or Konakry (Malinké: Kɔnakiri), is the capital and largest city of Guinea, a resource-rich but poorly developed nation in West Africa. A port on the Atlantic Ocean, Conakry is a crowded city, with multiple stalls selling bread, fruits, vegetables, fish, meat, poultry, wrought iron work, or clothing. Dating from 1885, the city has had a brief, somewhat turbulent history as capital of a French colony, then of a socialist dictatorship, and a flawed multi-party republic dogged by corrupt rule, infrastructure failure, and widespread poverty. In 2006, Transparency International ranked Guinea as the most perceived corrupt nation in Africa and one of the most corrupt countries in the world, ranking with Myanmar, Iraq, and Haiti. When Guinea's corruption is resolved its abundant resources can aid its release from poverty and allow individual freedom to grow and prosper. As the administrative capital of the nation, Conakry's situation is tied to that of Guinea's. Its improved conditions will aid the nation's prosperity. According to a legend, the name of the city comes from the fusion of the name "Cona," a wine and cheese producer of the Baga people, and the word "nakiri," which means the "other bank or side." Conakry is located in the west of Guinea along the Atlantic coast. The old city of Conakry was built on Tombo Island, one of the Îles de Los, which are known for their beaches and forested interiors, and were reputedly the setting of the Robert Louis Stevenson adventure novel, Treasure Island. The new colonial city is located at Kaloum, and has spread up the neighboring Kaloum Peninsula. A 984-foot (300-meter) causeway links the island to the peninsula. The coastal region of Guinea has a tropical climate, with a rainy season lasting from April to November, relatively high and uniform temperatures, and high humidity. Conakry's year-round average high is 85°F, (29°C), and the low is 74°F (23°C). Its average annual rainfall is 169 inches (4300mm). By the mid-1980s, fewer than 40 percent of Conakry's population had access to piped water. A 22-mile (36 km), 1000 mm diameter water pipeline was begun in 1992, from a storage reservoir to supply drinking water to the city. The city has grown along the peninsula to form five main districts. From the tip in the south west, these are Kaloum (the city center), Dixinn (including the University of Conakry and many embassies), Ratoma (known for its nightlife), Matam, and Matoto, home to Gbessia Airport. A monument to commemorate the 1970 military victory over the Portuguese invasion. 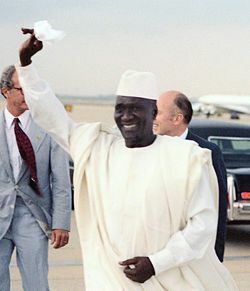 Socialist dictator Ahmed Sékou Touré. Hunters and gatherers occupied the Guinea area 30,000 years ago. The land composing present-day Guinea was part of a series of empires, beginning with the Ghana Empire which came into being around 900 C.E., followed by the Sosso kingdom in the twelfth and thirteenth centuries. The Mali Empire took control of the region after the Battle of Kirina in 1235. The Portuguese reached Guinea between 1460 and 1470, around the time the Songhai Empire (early fifteenth to late sixteenth centuries) was one of the largest African empires. The European slave trade started in the sixteenth century. An Islamic state was founded in the eighteenth century, bringing some stability to the region. In 1885, the two island villages of Conakry and Boubinet had fewer than 500 inhabitants. Britain ceded Tombo Island to France in 1887. Guinea was created as a colony by France in 1890. Conakry was founded on Tombo Island in the same year. In 1895, the country was incorporated into French West Africa. Conakry became the capital of French Guinea in 1904 and prospered as an export port, particularly after a (now closed) railway to Kankan opened the large scale export of groundnut from the interior. Industrialization began in the 1950s, when iron mining was developed on the Kaloum Peninsula and bauxite was exploited on the Los Islands. On September 28, 1958, Metropolitan France held a referendum on a new constitution and the colonies were given the choice between immediate independence or retaining their colonial status. While other colonies opted to retain colonial status, Guinea became the first French African colony to gain independence, with dictator Ahmed Sékou Touré (1922-1984), leader of the Democratic Party of Guinea, as president. At that time, Conakry had a population 50,000. Touré pursued broadly socialist economic policies, suppressed opposition and free expression, and had little regard for human rights. Under his leadership, Guinea joined the Non-Aligned Movement, and pursued close ties with the Eastern Bloc, while the Soviet Union provided financial and technical support. Touré broke off relations with France, in 1965, after accusing it of plotting to oust him. In 1970, conflict between Portuguese forces and the PAIGC in neighboring Portuguese Guinea (now Guinea-Bissau) spilled into the Republic of Guinea when a group of 350 Portuguese troops and Guinean dissidents attacked Conakry, and freed 26 Portuguese prisoners of war held by the PAIGC before retreating. Touré’s death in March 1984, allowed Lansana Conté (b. 1934), a Muslim and a member of the Soussou ethnic group, and Diarra Traoré (1935-1985) to seize power in bloodless coup. Conté became president, and Traoré prime minister. Political parties were outlawed and the constitution abolished. Conakry's population had reached 600,000 in 1980. Traoré led a failed coup attempt against Conté in July 1985, and was subsequently executed. [Conté]] denounced the Touré regime's human rights abuses and released 250 political prisoners. He also encouraged the return of approximately 200,000 Guineans from exile. But the government remained dictatorial. Political parties were legalized in 1992, and the first multi-party elections, held in 1993, marred by irregularities, confirmed Conté as president. Guinea's armed forces rebelled in 1994, against low pay and poor conditions. The presidential palace was set on fire and 30 people were killed. Conté was re-elected for a five-year term in 1998, in flawed elections. In 1999, he began to replace technocrats with “homegrown” ministers from his Soussou ethnic group. The leader of the opposition Guinean People's Rally, Alpha Condé, was jailed for five years in September 2000, to be pardoned May 2001. A referendum, held in November 2001, endorsed Conté's extension of the presidential term to seven years and allowed the president an unlimited number of terms. In June 2002, Conté's Parti de l'Unité et du Progrès, and associated parties, won 91 of 114 seats in heavily boycotted elections. Since early 2002, power and water cuts have been a daily burden for Conakry's residents. Government and power company officials blamed a drought, in 2001, and the failure of aging machinery, for the failure of the supply of hydro-electric power. Critics of the government cited mismanagement, corruption, and the withdrawal of the power company's French partner at the beginning of 2002. As of 2007, much of the city had no traffic lighting overnight. Anger at power and water shortages in Conakry and discontent at Conté's rule led to protests. On January 10, 2007, Guinea's trade unions and opposition parties called on Conté to resign, accusing him of mismanaging the economy and abusing his authority. The strike ended on January 27, with an agreement in which Conté would appoint a new prime minister. Conté's choice of Eugène Camara was deemed unacceptable by the unions, and the strike resumed on February 12. Martial law was imposed on the same day. Violence reached a peak when up to 100 people were killed when the army confronted protesters. On February 26, Conté named Lansana Kouyaté as prime minister. The strike ended on February 27, and Kouyaté was sworn in on March 1, 2007. Guinea is a republic in which the president, who is chief of state, is elected by popular vote for a seven-year term and has no limits to the number of terms he may serve. The the prime minister, who is head of government, is appointed by the president. The unicameral People's National Assembly consists of 114 members elected by a mixed system of direct popular vote and proportional party lists. The city itself makes up one of the eight Regions of Guinea. 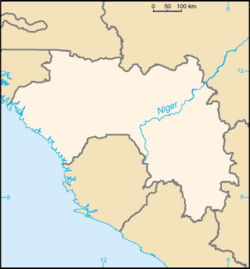 The Conakry Region, which shares the same borders as the city of Conakry, includes five of the nation's 38 urban communes. Conakry ranks as a special zone. District-level leaders are elected, while the president appoints officials to all other levels of the highly centralized administration. Guinea possesses major mineral, hydropower, and agricultural resources, yet remains an underdeveloped nation. The country has almost half of the world's bauxite reserves and is the second-largest bauxite producer. The mining sector accounts for over 70 percent of exports. Conakry is Guinea's largest city and its administrative, communications, and economic center. The city's economy revolves largely around the port, which has modern facilities for handling and storing cargo, through which alumina and bananas are shipped. Guinea's per capita GDP was estimated at $1100 in 2007. An average Guinean in Conakry will get a monthly wage of about $45. Manufacturing in the city includes fruit canning, fish packing, printing, automobile assembly, and the production of aluminum utensils and plastics. Highways, as well as a 411-mile (661-kilometer) railroad from Kankan, and a 90-mile (145-kilometer) branch line from Fria, all lead to Conakry's deepwater harbor, which can berth vessels of 36-foot (11-meter) draft. Gbessia International Airport, which services a number of West and North African airlines, as well as Brussels Airlines, Air France and Royal Air Maroc, is located 9.5 miles (15 km) northeast of the city. 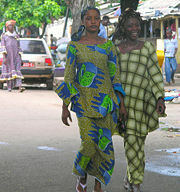 Women in native attire walking in Conakry. The population of Conakry is difficult to ascertain, although the United States Bureau of African Affairs has estimated it at approximately 2 million. 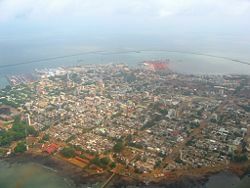 Conakry is the largest city in Guinea, comprising nearly one quarter of the nation's population and making it more than four times bigger than its nearest rival, Kankan. The population of Guinea comprises about 24 ethnic groups. The Soussou, comprising 20 percent, live in and around the capital Conakry, Forécariah, and Kindia. The Peuhl make up 40 percent of the population, the Malinke 30 percent, and smaller ethnic groups 10 percent. French is the official language, although each ethnic group has its own language. Muslims make up 85 percent of the population, Christian 8 percent, indigenous beliefs 7 percent. Conakry is the seat of the University of Conakry, founded in 1962, and is the location of teacher-training, vocational, nursing, midwifery, and military schools. Attractions in the city include the Guinea National Museum, several markets, the Guinea Palais du Peuple, Conakry Grand Mosque which was built by Sekou Toure, the city's nightlife and the nearby Iles de Los. The city is noted for its botanical garden. When Charles de Gaulle's France held a referendum on a new constitution and the creation of the Fifth Republic in September 1958, it offered its colonies a choice between immediate independence and the new constitution. All except Guinea voted for the new constitution. Thus, Guinea became the first French African colony to gain independence, at the cost of the immediate ending of all French assistance. This was the beginning point of decline. Once one of the most flourishing colonies of the French Empire, the newly independent nation found itself with no political or financial support. What followed was the dictatorial regime of Sekou Tour. His 26-year rule left deep scars in one of the richest countries in Africa, which has not yet healed. The 1990s saw Guinea continuously listed as one of the poorest nations on earth, in spite of the fact that it is rich in natural resources. What exists in the early twenty-first century is a lack of electricity and other infrastructure, rampant corruption, a lack of skilled workers, and political uncertainty due to the failing health of President Conté, all of which has served to sap investor confidence. Improvements in government fiscal arrangements, literacy, and the legal framework are needed to move the country out of poverty. International observers have noted that "because of their violent history, Guineans have a respect for and unlimited fear of authority, particularly the military leaders who run the country." This has served to give the rulers more power, who, unfortunately have abused their positions. Since independence, a deep level of distrust has been displayed among those who would rule. In order for the city and the nation to prosper, international intervention will likely be necessary, at least in the form of financial aid and political and social guidance and oversight. ↑ World Gazetteer, Conakry Retrieved March 29, 2012. ↑ Guinee Conakry, Histoire de Conakry. Retrieved September 17, 2008. ↑ Time Magazine, Cloudy Days in Conakry. Retrieved September 17, 2008. ↑ James Copnall, Conakry's dark streets turning orange, BBC News. Retrieved September 17, 2008. ↑ UN Office for the Coordination of Humanitarian Affairs, In-Depth: Guinea: Living on the edge. Retrieved September 17, 2008. Africartmodern. Conakry the Capital. Retrieved September 3, 2008. Callimachi, Rukmini. July 19, 2007. Kids in Guinea Study Under Airport Lamps. Washington Post. Retrieved September 3, 2008. Odile, Goerg. "Chieftainships between Past and Present: From City to Suburb and Back in Colonial Conakry, 1890s-1950s." Africa Today 52(4): 2-27. O'Toole, Thomas, and Ibrahima Bah-Lalya. 1995. Historical dictionary of Guinea. Lanham, Md: Scarecrow Press. ISBN 9780585105284. UN Office for the Coordination of Humanitarian Affairs. IRIN In-Depth, Guinea: Living on the edge. Retrieved September 3, 2008. World Fact Book. 2008. Guinea. Retrieved September 2, 2008. This page was last modified on 17 March 2017, at 15:24.